Whitney Greene, Kayla Foster, Scott Gwinn, Jesse Koerner from the Bellarmine University Physical Therapy Program's Pathophysiology of Complex Patient Problems Project. A 20 year old female reported to physical therapy with numbness and severe weakness on the left side of her body, specifically her leg. She also complained of moderate low back pain. The patient was recently involved in a bicycle collision with a motor vehicle 3 days ago when she was on her way home from school at a small community college. The patient reports the vehicle clipped the front of her bike while crossing an intersection, causing her to crash hard on her left side. The patient doesn’t remember if she hit her head, but she was wearing a helmet. She only recalls feeling very startled and dizzy after the collision with a couple of scrapes on her left leg from the pavement. The patient was taken to the local, rural hospital to screen for a concussion, which came back negative, where she was then released from the hospital. Since the injury 3 days ago, the patient reports her dizziness has converted to double vision, has difficulty swallowing like there is a lump in her throat, and notices occasional slurred words. Patient continues to have difficulty walking and loss of balance since the accident. Patient reports having increased stress and difficulty completing school work in the past couple of weeks. Patient Goals: Patient would like to return to riding bike, walking to class without difficulty, and improve her balance. Patient presented with slurred speech and had difficulty hearing PT during the evaluation. During ambulation, patient presented with a limp on her left side and a decreased gait speed of 1.04 m/sec. Patient also displayed painful facial expressions during LLE MMT. Based upon the exam findings, the clinical impression is unclear based on a physical therapy diagnosis. The unusual pattern of signs and symptoms do not follow any musculoskeletal or neurological condition. These inconsistent findings include female gender, unexplained paresthesia and muscle weakness, visual impairments, hearing loss, gait disturbances, slurred speech, and headaches. These signs and symptoms were presented after the patient had a non trivial accident of falling from her bike. Although she was tapped by a car, concussion testing came back negative and she only suffered scrapes on her legs. Based on patient history and inconsistent findings that cannot be explained by an organic or neurological problem would lead the physical therapist to consider conversion disorder. In cases of conversion disorder patients can experience paralysis or parasthesia even when they are not physically harmed enough to cause this impairment. Some of the other possible differential diagnoses, but not limited to, are multiple sclerosis, myasthenia gravis, idiopathic dystonia, system lupus erythematosus, Guillain-Barre, post-encephalitis syndrome, and brain/spinal tumors. These, as well as any other possible diagnoses identifying an organic cause for the signs and symptoms, must be ruled out in order to assume the patient is suffering from conversion disorder. It is important that the patient understands that the other tests were negative without confrontation, and that a full recovery can be expected. The examination findings consist of unexplained pain, paresthesia, and muscle weakness in the LLE, gait disturbances with a limp and decreased gait speed, visual impairments, hearing loss, slurred speech, difficulty swallowing, and headaches. The patient reported poor scores on the LEFS, FABQw and FABQpa; and displayed deficitis in the Berg Balance Scale, 10 Meter Walk test and 5 x Sit-to-Stand test. These unusual patterns of symptoms and objective findings do not follow any specific musculoskeletal or neurological condition, such as radicular symptoms or multiple sclerosis; which lead us to the diagnosis of conversion disorder. A patient with conversion disorder needs to see improvements in physical therapy to help the patient believe they are getting better. The progression follows the same progression as for someone with a neurological disease with known origins because research has shown conversion disorder follows similarly to the progression of a neurological disorder. Research further suggests following PT Practice Pattern 5A: Primary Prevention/Risk Reduction for Loss of Balance and Falling for this diagnosis. Patient was able to completely recover functionally and integrate back into everyday life with normal gait and balance with abolishment of all prior symptoms. Patient was able to return to school and walk or ride her bike to class. Patient achieved goals of walking, riding bike, no complaint of weakness and integrated back into the social life at her school. She recently made the Dean's list and is now leading the Pre-PT club. Patients diagnosed with conversion disorder may pose as difficult for physical therapists to treat based on the inconsistencies and lack of organic cause for the subjective and objective findings. The present case focused around expected findings with this disorder with an intervention basis derived from a prior rehabilitation model and case series from the literature. Based on the findings, this course of treatment has shown recovery with patients presenting with conversion disorder, however each patient will present in a different manner and a variation of the described symptoms may be present. Thus, this model should be modified to cater to the patient and each treatment should be individualized based on the specific findings patient to patient. Although conversion disorder does not present with a primary cause to need physical therapy, research has shown that when the patient can see their strength and functional gains, it helps them recover quicker psychologically from this disorder. During physical therapy it is important to recognize when the patient becomes fatigued and give them rest breaks or tell them to take time, recover and then try again. The therapist should always provide encouragement and make the patient feel as though they are achieving their functional gains. ↑ Conversion Disorders. Medscape website. http://emedicine.medscape.com/article/287464-overview. Last updated on June 26, 2013. Accessed on March 10, 2015. ↑ Conversion Disorder Specific Culture, Age, and Gender Features. Recurrent Depression website. http://www.recurrentdepression.com/site/more/111/. Last updated on September 18, 2006. Accessed on March 10, 2015. ↑ 3.00 3.01 3.02 3.03 3.04 3.05 3.06 3.07 3.08 3.09 3.10 3.11 Ness, D. Physical Therapy Management for Conversion Disorder: Case Series. Journal of Neurologic Physical Therapy. March 2007; 31(1): 30-39. doi: 10.1097/01.NPT.0000260571.77487.14. 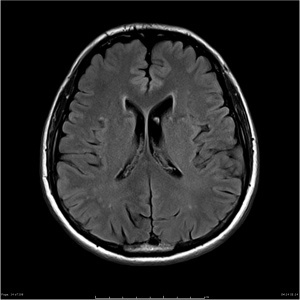 ↑ Normal Neurodegenerative MRI Protocol. Radiopedia Website.http://radiopaedia.org/images/4935581. Accessed March 26, 2015. ↑ Rehabilitation Measures Database. http://www.rehabmeasures.org/default.aspx. Accessed on March 10, 2015. ↑ 6.0 6.1 Heruti R, Levy A, Adunski A, Ohry A. 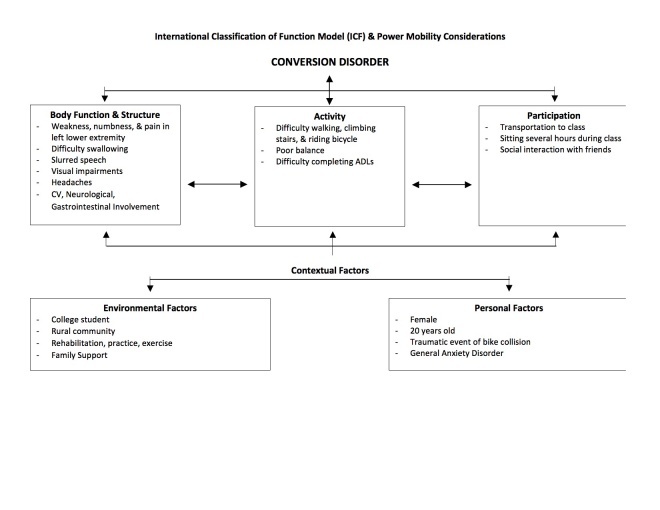 Conversion motor paralysis disorder: overview and rehabiliation model. Spinal Cord. July 2002;40(7):327-334. Available from: MEDLINE, Ipswich, MA. Accessed March 14, 2015. ↑ Conversion Disorder. Physiopedia Website. www.physio-pedia.com/Conversion_Disorder. Accessed on March 24, 2015.